Didn't we all love the idea of advent calendars when we were growing up? The little doors you got to open, a small treat or gift. What’s not to love about them? So when a friend pointed out a whiskey advent calendar a couple years ago, we were very excited about the prospect. Then our “adult” brains kicked int: Couldn't we just as easily make our own? At anywhere between $150 to $250 plus shipping, the whiskey advent calendars we’ve seen aren’t cheap. Plus, for some of them, you have no idea what you’re getting. So you’re getting 24 ounces of booze for $150 or more. Technically there are slightly more than 25 ounces in a 750ml bottle of booze, although typically distillers overfill so you’re getting about 26 ounces. So the calendar contents should be the equivalent of a ~$160 bottle of booze. Seems like a pretty good deal then. Or is it? Here’s the thing. They usually include 2 or 3 quite expensive whiskeys, but most of the bottles are in the $40–$60 range. Cool. There are a lot of really nice bottles out there in that price range. But once you start averaging out the cost, going the DIY route allows you some great opportunities. Being the nerds that we are, we put together a spreadsheet (note: prices are for WA and our 20% tax) and started filling it in with some lovely libations. Very quickly you start to see that even if you have some really expensive bottles on there, due to averaging, your cost-per-person is quite reasonable. Certainly less than what you’d pay for a pre-made calendar. Feel free to copy our spreadsheet and fill it out to your heart’s content. Of course, the trick is finding 25 people to go in on the calendar with you. But this is the nice part. Can’t get together 25 people? What about 12? Sure your cost doubles but now you’re get two ounces of each spirit instead of one. (Really, one ounce per day is a bit abstemious, is it not?) Or you can change up what you’re buying. Maybe you want to buy “shares” in the calendar as early Christmas presents. At only ~$67, you’d be getting someone a really nice Christmas present, in our opinion. Way better than socks, some useless kitchen gadget or what have you. Feeling adventurous? Why not branch out from whiskey and add in some lovely gin, or rum, mezcal, or brandy! This is the great thing about going the DIY route. You get to make it up however you want. Also gin and rum tend to be less expensive so, once again, your average cost goes down. What about bottles to divide up the portions, you say? Ask and the internet shall provide. Specialty Bottle to the rescue, though a quick internet search will turn up several providers. 24 appropriately sized bottles will run you $18 to $20, but save them and you can reuse them every year. Once you have the bottles in hand you can then get all artsy and craftsy. Go out there and make Martha Stewart proud! Wouldn’t you rather have one of these every day of December? 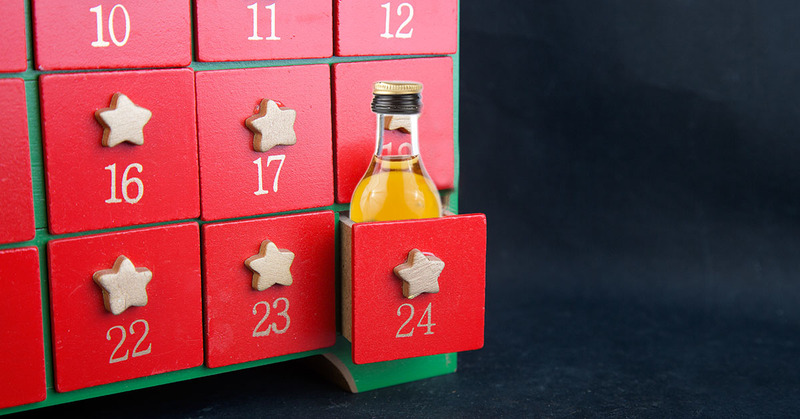 There you have it: For quite a bit less, you can put together your own DIY booze-y advent calendar. It just takes a few friends and you’re off to the races. Cheers! It's all about our ridiculous love of booze.